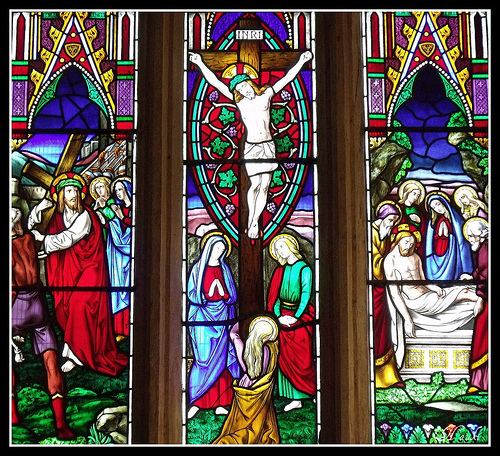 Stained glass windows were used to communicate basic bible stories to a largely illiterate world. Part of this was an extreme case of the Bible being in a language people didn’t understand. To communicate the stories from the Bible, the church used art. The buildings, decor, everything was to communicate and teach something about God, to inspire worship. For better or worse, we’ve lost the sense of art in many churches. God frequently used artistic expression as a tool to both remember and pass on who He is. Think about this, how abstract is a pile of stones in a middle of a river? The picture itself has to be explained. Think of the passover where God uses taste to communicate bitterness- the bitter herbs. Intertwined through the Old Testament God placed artistic expression to generate conversation. Some expressions were very abstract, others very understandable, they all were intended to generate conversation and engage people in theology- understanding who God is. If all the words in your ministry environments disappeared, what does it communicate about God and who you are? What have you done to help people see what God has done through the history of your church or ministry? Do kids in your ministry start asking questions and talking about God because of what surrounds them?